If you’re expecting news of the new girls, stop reading now. Though I searched high and low and found all the horses but Bounce’s band and Seven’s band – and, well, the girls – I didn’t find the girls. At all. Not hide nor hair. I’ll tell you who they’re for sure NOT with (as of Sunday): not Steeldust’s band, not Traveler’s band, not Cinch and Bruiser, not the pintos, not Poco, Bones and Roach, not David and Shadow. Maybe they’re wandering far afield, testing their new boundaries, walking new paths, learning the landscape of their new home. Maybe they’re looking for something familiar – a hill, a smell, something that reminds them of home that used to be. Maybe they’ll stay together; maybe they’ll split up and go their separate ways. Maybe I’ll find them next weekend. It was a gorgeous weekend, but it’s so, so dry. We need rain. The horses seem to be wandering quite a bit. 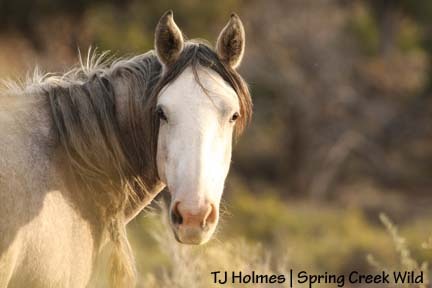 My human eyes don’t see much vegetation that looks scrumptious, but the horses look pretty good – even fat in some cases. First up Saturday was the big band: Steeldust and the Bachelor 7. Right around the corner: Cinch and Bruiser. Hollywood is still hoarding his small harem but basically part of the band. She’s hard to see in this photo, but the doe the horses are looking at is maybe the first deer I’ve seen in the area since early spring. She caught the attention of all the horses, who stood looking … until Storm suddenly bolted down the hill, which sent all the horses galloping. They ran right down to the pond – the same one the new girls drank from Friday – drank, then wandered out into the open to the south and east. Cinch and Bruiser followed them to the pond and had a little chat with some of the Bachelor 7, not visible here. I drove on into the basin and around the loop and up toward the north, and kept the binoculars practically glued to my eyeballs. From Round Top, I saw David and Shadow, who have been elusive lately. They were at a little puddle – the one Grey and the youngsters and Bruiser were playing in last Sunday, I think – but a little separate. David waited for Shadow, who had wandered east. His patience won; she finally wandered back at a mosey, maybe an amble, and followed him across the trail and down to the little “valley” below (westish of) Flat Top and Round Top and out of sight. 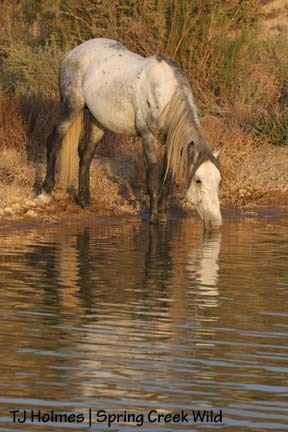 From a hill in the north, I could see that Grey/Traveler was up by the water catchment – along with Steeldust’s band. I didn’t see any other horses that day. Grey and his band were up by Filly Peak in the shade by the time I drove around to see them. Steeldust and the big band were nearby but east of the road and still in the light. Hanging out close to the bachelors were the pinto boys. I took this picture of the boys from the Jeep. You can still see some mud on Bruiser, but he has shaken off most of what had him looking like a dark boy last weekend. Hollywood with his girls, Baylee and Piedra, who was taking a cat nap in the late sunshine. 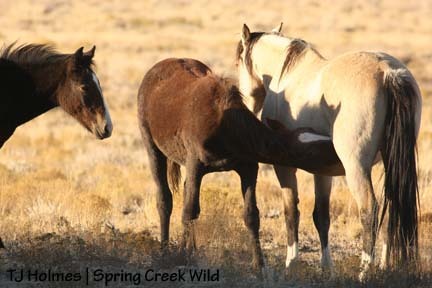 Last fall, I don’t remember seeing any of the foals nursing this late, but this year’s babies are still nursing. 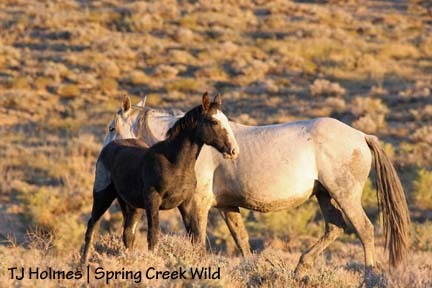 Ember, nursing in the photo above, is the oldest of this year’s foals. 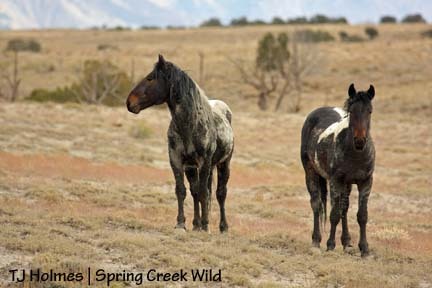 Pinon is the curious youngster at left. And there’s little Storm, youngest baby in the basin. All the babies – and big babies, too! – are getting fuzzy. The days are practically perfect, but sunset comes early, sunrise comes late, and it gets chilly under that endless night sky over Spring Creek Basin. Late sunrises are good for a non-early-riser like me. Sunday, Steeldust and his entourage were down in the broad “valley” east of the water catchment. They stayed out there – generally speaking – most of the day. I drove around the loop and spotted Bones’ white face from the roller-coaster ridge road. I hiked down to make sure they were all there. 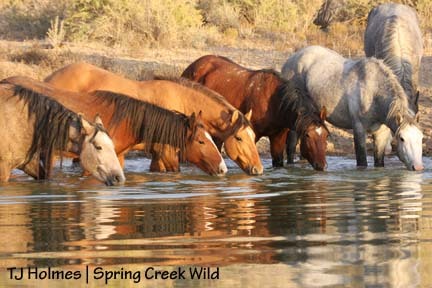 They were lounging by Spring Creek, which actually has flowing water! Not much, and shallow, but it has to be better than drinking from puddles. These guys are pretty easy going, but I was lucky again to find them across an arroyo (Spring Creek). 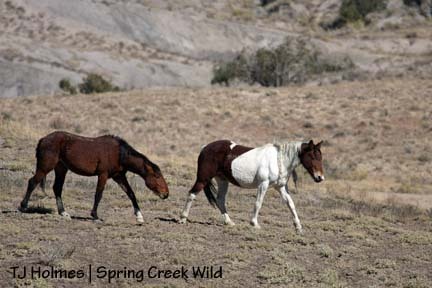 I headed on out, passing Steeldust again on my way, and drove down the county road to hike in and look for the pintos – and see if the new girls were with them. They weren’t, but the pintos, still with Copper and the boys, were back in the vicinity of their “favorite” hill. The weirdest thing was that they moved between my first sighting of them and when I actually found them, so it took a little looking. So close, so hard to find. Probably more to that than I even know. When I did find them, they were on a hill across a gap from where I was. 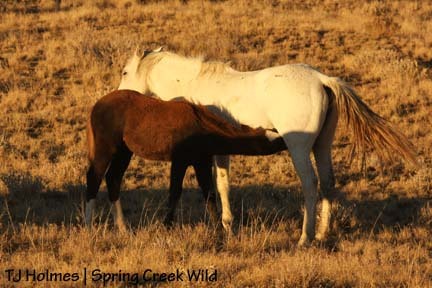 As careful as I am with all the horses, I’m especially careful with this group because Kiowa has been so protective of Spook, this year’s baby. I’ve been trying to get her to know I can share their environment without being a danger to them. The weirdest thing about this encounter with them was that I “snuck” up on them in the open. I stood on my hill, occasionally taking a step or two forward, waiting for one of the eight to notice me. I finally got to the edge of my hill where it started to slope down to the arroyo between “my” hill and “their” hill and sat down, and hung out, and enjoyed watching them graze across the hill. 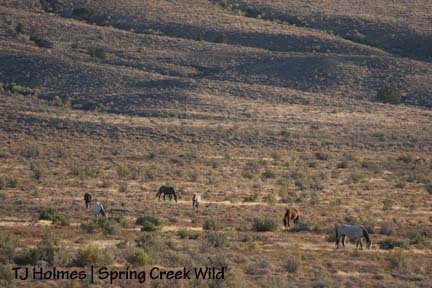 The horses were pretty well spread out, and I tried to look at them with fresh eyes: If I didn’t know them, what would be my first impression of the eight horses on the far hill? On the left side of the hill: Mesa and Copper. To the right of them: Chipeta and Corazon. Sort of in the middle: sisters Reya and Spook. On the right side of the hill: Kiowa and Ty. 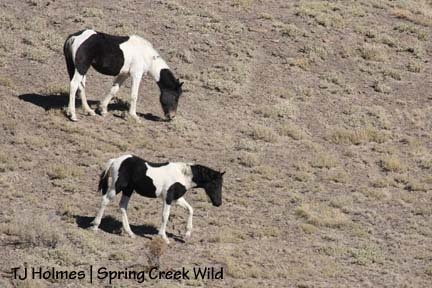 Because of their size, yearling Reya and baby Spook would be easy to identify. At one point, Spook marched over to Kiowa and started nursing. Pretty obvious relationship there. 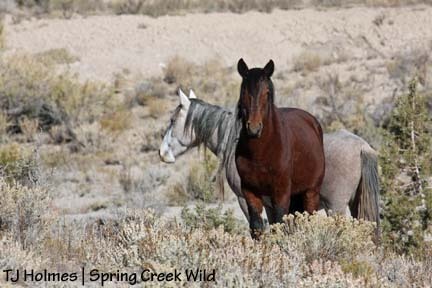 Both the above are stallions; one I have identified as more in the band stallion position than any of the others. Which one do you think is most likely that stallion? 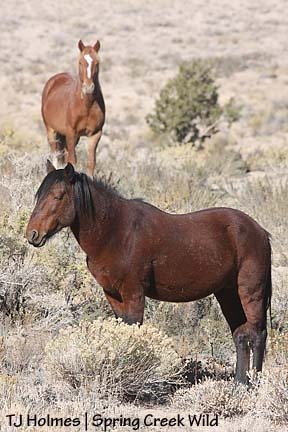 The stallion on the left is bigger, his coat is sleek and shiny; he’s in good condition. 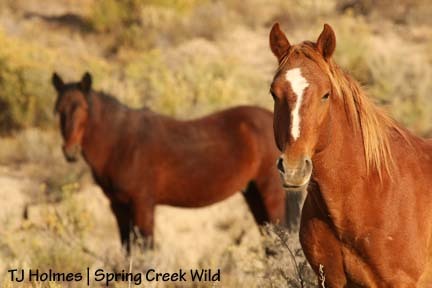 The stallion on the left is smaller, he looks scrawnier; he may be a bit muddy, but he’s definitely scruffier. Fifty-fifty chance … guess? OK, it’s kind of a trick question. The stallion that looks like the king is at the bottom of the heap. What can I say? Mesa at left; Copper at right. Here’s Corazon, left, and Chipeta, not far up the hill from Mesa and Copper. Copper wasn’t worried. Back to the what-if-I-didn’t-know-them question. My first thought probably wouldn’t be a mare and a foal and a yearling with a bunch of stallions – or even another mare. Maybe I’d think most of the others also were mares. But which one was the stallion? Once they were all together, they settled down again. At this point, neither Kiowa, Ty nor the babies had looked up or seemed to notice me. This pic of the sisters was taken before the above photo, and Spook walked right over to mama to nurse. She was so funny afterward – almost “drunk” on her mother’s milk, she immediately fell asleep on her feet! I watched for a few minutes longer, then got up to leave. And this is what I saw when I turned for a last look. Only Mesa is missing from this family portrait. The glam big band was still out in the open when I returned to the main part of the basin for another trip around the loop. Guess who I found out for a Sunday drive? Photographer Claude Steelman, his wife, Katie, and friends Steve and Lisa Mackey. They were excited to see Steeldust and company, and they reported seeing “your boy” (Grey/Traveler), drinking at the pond below the roller-coaster ridge, and Poco, Bones and Roach! I was happy they saw all those ponies. But they hadn’t seen anybody else, either. Traveler and the fam were napping between the pond and Round Top when I got around to that area. Northish from the twin ponds, I spotted Bones again, with Roach or Poco under a nearby tree. I looked especially hard back in the east pocket for Bounce and/or Seven, but those ponies had other ideas this weekend. On the way out, Steeldust and groupies again. There’s my last glimpse of the wild beauties before I headed out of the basin around 5 p.m. To the far left, you can see Bruiser and Cinch. Better luck next time! But how can you go wrong seeing so many horses? I did see Bounce, Alegre and Gaia last Sunday, but it’s been a few weeks now – since the tour – since I’ve seen Seven, Molly and Roja. I’d like to see Molly to check her condition. If you didn’t stop reading, thank you on behalf of the horses. 🙂 I can’t even say I’m disappointed, not seeing the new girls – I had anything but a disappointing weekend! They are elusive, but maybe it makes finding them all the more wonderful … and full of wonder. And there’s always next weekend! 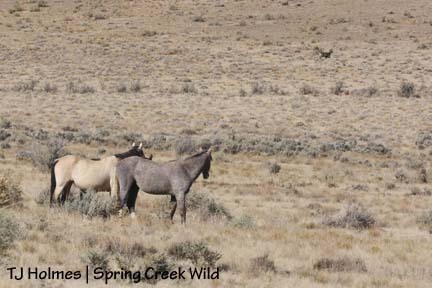 At long last, our three new mares, introduced to increase our herd’s genetic variability, are in their new home in Spring Creek Basin. The last three introduced mares came in 2000 or 2001, I think, but only Luna remains (Slate died over the winter; what happened to the other mare is unknown). 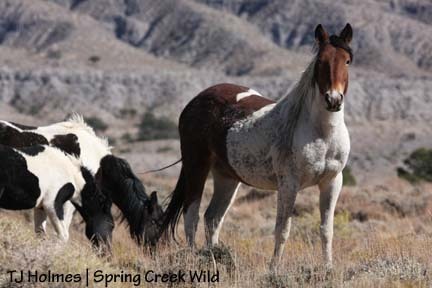 Because our herd is too small to maintain genetic viability on its own, the BLM introduces mares from other, similar type herds every few years. 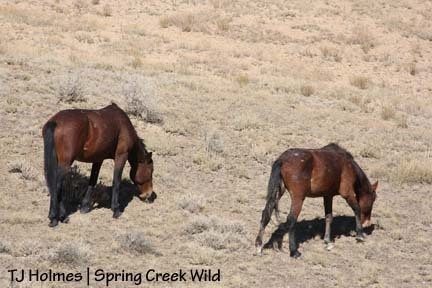 These three mares, like the last three, are from Sand Wash Basin in northern Colorado. A roundup there started last Friday (Oct. 17). This introduction had been planned at least since last fall. 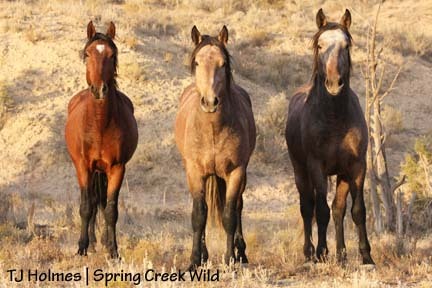 Bob Ball, our BLM herd manager, went to Craig this week to select the mares, which have all been aged at 2 years old. He called me today on the way, and Jamie Sellar-Baker, associate manager of the Dolores Public Lands Office, was out patrolling and greeting hunters in the area, and had the near-perfect timing to stop in just before Bob and the mares arrived. 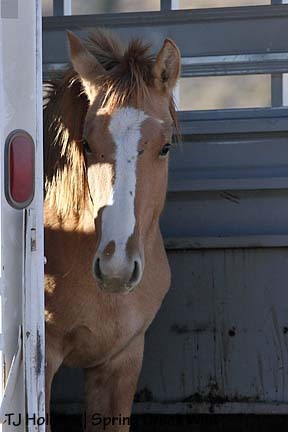 This apricot dun mare was the first out of the trailer, followed closely by the black pinto mare. These two came out of the trailer very close to each other, so I didn’t get clear first shots of the pinto. 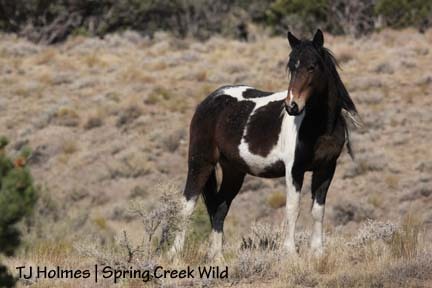 She’s not an obvious pinto; she has just three small white “slashes” on her left side. 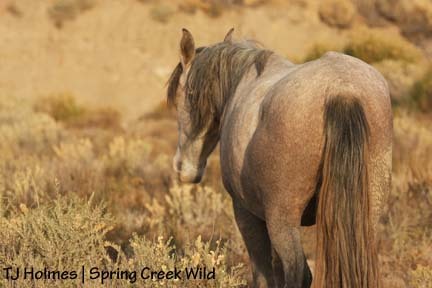 One is on her barrel, just behind her elbow, and the other two are smaller and toward her flank. From some angles, the smaller slashes are hard or impossible to see. 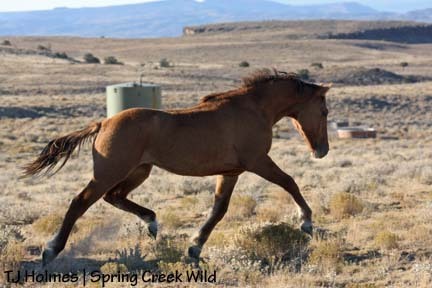 This mare’s coloring is similar to Hollywood’s, maybe not quite as “orangey.” Look at that big trot! Too bad about the “unnatural background,” but you can see the big green water tank and the two drinking tanks that provide water from the catchment. 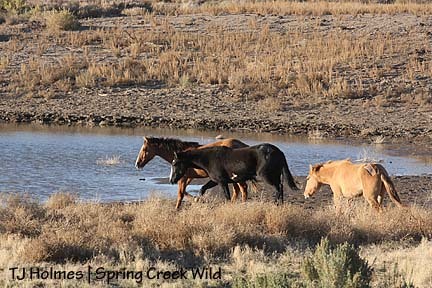 Bob pulled in and released the mares from the trailer right by the water catchment. Grey/Traveler was right down the hill! I was terribly excited, but as it turned out, I don’t think he ever saw the new mares. 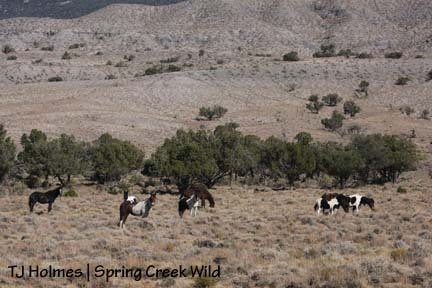 They’re pretty hard to see in this photo, but pinto bachelors Cinch and Bruiser are in the background, directly above the apricot dun (above the first group of trees, above a little ridge, below the second swath of trees). 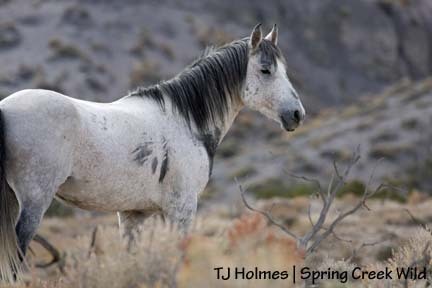 Jamie also had earlier spotted Alpha, in Steeldust’s band, in the far northwestern hills (not in this photo). Eagle eyes! 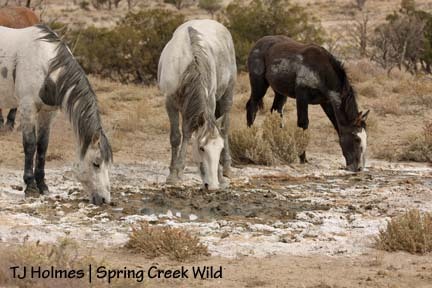 The mares started grazing pretty quickly after they got out of the trailer, but they also kept moving, and they completely bypassed the water tanks. They ended up by the small water hole by the entrance and the trap site. 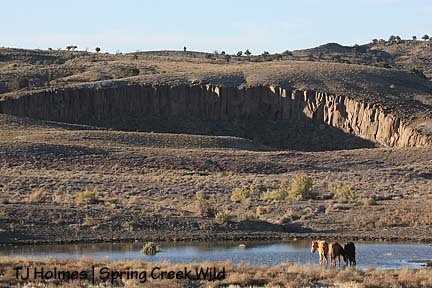 In the background here, you can see the canyon that rises above Spring Creek. They didn’t go right into the water, which worked well for me because I couldn’t see them very well when they first approached the pond. They walked along high ground from the water catchment almost until they got to the pond, and I took a wide-arc approach until I got to a ridge just west of their ridge. I took these photos from the end of the ridge so I wouldn’t bother them. When they left the pond, I headed back to the catchment. First impressions: I like these girls! The apricot dun, although she was first out of the trailer, seems to be low on the totem pole, based on the black mare’s attitude toward her. At least twice, the black mare pinned her ears and warned the little mare away. The other dun mare led the way down off the ridge and right to the water, with the black mare following right behind her. They all have blazes, but the apricot dun and black mare have very wide blazes, and the other dun mare’s is narrower. The black mare’s hooks over her left eye, and the apricot dun has a spot at the bottom of her blaze, above her right nostril. 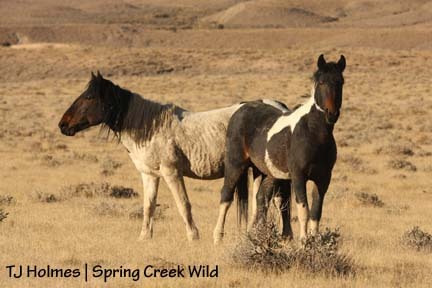 Both dun mares have dorsal stripes, and zebra stripes are obvious on the apricot dun (though not black like Hollywood’s), not so obvious on the other. 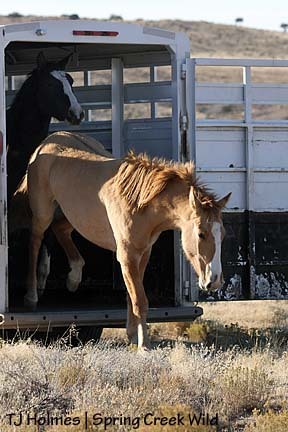 The black mare has a left front stocking, the dun has a left hind pastern (and possibly some low white marking on her left front), and the apricot dun seems to have a left hind fetlock that may be distinctly visible just from the inside (see the pic of her getting out of the trailer). When they walked toward the pond, I didn’t notice any distinct markings. The dun mare and black mare both have white chins (at least partially)! Traveler and his band were just finished drinking from the smaller water tank when I approached on my way back to my parked Jeep. Ahh … I had really hoped he’d come right up the hill, see the new girls and go “welcome” them! Alas, it was not to be. They were very calm; I don’t think they ever saw the mares. From left, Houdini, Iya, Jif and Two Boots. So there’s your first look at our new girls. Unfortunately, I had to return to civilization, but tomorrow will see me back in the wild. I can’t wait to see who – if anyone yet – they’ve hooked up with. Maybe one or some of the bachelors will get lucky! Although I hadn’t seen this little band for several weeks, it was worth the wait. Poco, Bones and Roach all look great. After the past year of getting to know my ponies, I’m close to a guarantee: The harder I look for particular horses, the more likely it will be that when I find them they’ll be right out in the open. A little after those hikes, in the Jeep, on the road, sun inching closer to the horizon hills, badda-bing: Through the binoculars, I saw a dark spot that turned out to be Poco’s back. Very close: Bones. They were in that little valley between Knife Edge and Lizard Mesa. I drove on and scanned; drove on, stopped to scan … Hello! Steeldust’s band just a short distance off the road in a grove of pinons. I interrupted the hunt for Poco’s band to take some pix of Steeldust’s group. Here’s a pic of Bones’ healed fractured pelvis that probably shows it better than any other pic I’ve taken. But don’t just look at that – look at her little belly! She’s not what I’d call a fat girl, but she looks WAY better than she did at this time last year, and I’m encouraged to see her going into this winter with some fat on her, err, bones. Poco was all shy and spent most of his time napping at the far edge of the little “island” they were on. I shot from various points on the other side of the not-so-deep, fairly broad arroyo that curved around their little island/oxbow. Bones was closest to Roach when I approached, then she wandered over to Poco to feast on that greasewood bush. One last look from Bones before I left these wanderers to their grazing and naps. So where was I? Before I get back to Steeldust’s band, let me go back to Round Top. It’s hunting season, of course, and it’s Colorado, and we have a high percentage of out-of-state plates in the areas with drivers and passengers sporting blaze orange. So far, like last year, I’ve seen plenty of traffic along the Dolores-Norwood Road and the Disappointment Road but not too much in the basin. Based on tire-track evidence, a few vehicles have been through since I was there last. I did pass a pickup Sunday with a man and woman, but I think they might have been looking for horses more than deer or elk. I drove the loop counter-clockwise again, and from the road, I spotted a shiny spot and a horse shape that eventually moved right between Flat Top and Round Top. During the tour with Kathe and Bob a couple of weeks ago, we saw Seven’s band there. 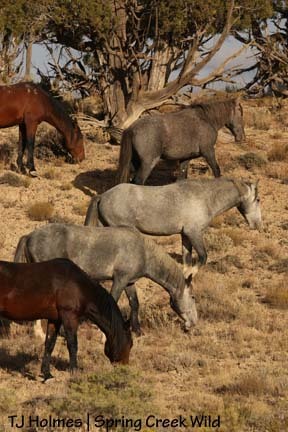 So I thought it might be him again, with Molly or Roja as the “horse shape,” and the other one in the trees. And another surprise: Cinch and Bruiser farther west. I parked at Round Top’s base and took the trail around the west side. There were some faint signs of horse traffic and a few coyote prints – and one sadly deflated and worse-for-wear “Happy Birthday” balloon (which made its way into my ever-present trash bag back in the Jeep) – but it didn’t look like it has seen much use lately. Looks like Iya had done a little splashing in the mud. They were waiting for the other horses to reach them. Clearing the coast before returning to Mama. Disclaimer: Houdini is Two Boots’ and Iya’s dam, but Grey/Traveler is not the actual sire of any of these horses. Once they reunited, they walked closer to Flat Top, where they drank from a pretty yucky, white-salty, muddy little puddle. Grey got there first, and he left last. I guess the boy was thirsty. This pic doesn’t show them well, but notice the black splotch on his shoulder. He had another one on his chest. Houdini shows what she thinks of the water puddle. Somebody’s been playing with the finger (hoof?) paints! Notice the little streak on his face. 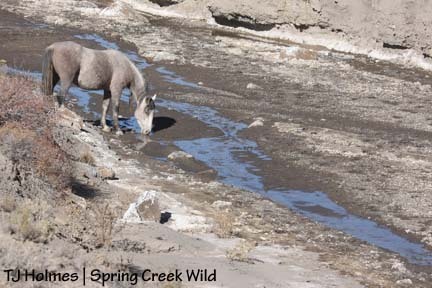 The next time I saw the band, I was on the spiny ridge and the horses were on the road heading toward the water catchment for some rainwater-pure, fresh H2O. 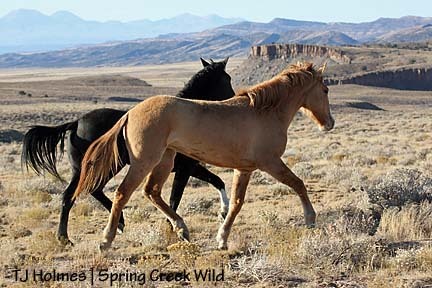 Cinch is at right, and Bruiser is the dark mudball on the left, demonstrating the wild horse version of “look! what’s that over there? !” Too bad for the ponies, I have eyes only for them. Yes! I promise that’s the same horse! Apparently he found the same tar-baby pit Grey/Traveler and the youngsters were playing in. After the boys went back to grazing, I went around the south side of Round Top a short distance to check on the still-dry water hole. No more horses. So now we’re back to the point where I “found” Steeldust’s band, “hiding” in the trees right by the road. This photo was taken right from the driver’s seat. Look at my long-legged little Storm-boy at right, with the light turning his spiky mane to gold. 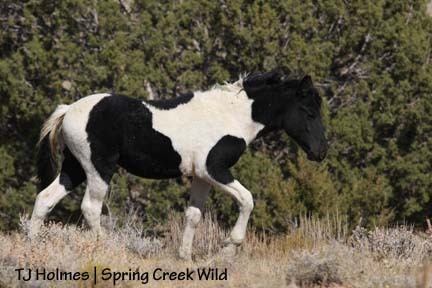 Can you believe he’s just a few days shy of three months in our Spring Creek Basin on this beautiful planet? And over on the left, his head just sticking out of the trees is Mouse, standing just in front of Hollywood’s girls, Piedra and Baylee. They and Hollywood seem to have reached a comfortable balance of friendship lately, and Holls doesn’t seem too worried about keeping them apart. The wayward boys are all “home.” Duke, Hook, Kreacher and Chrome had split away from the band for a few weeks. Last weekend, Duke was back with the band, and now all the boys are back. From bottom to top: Duke, Kreacher, Chrome, Hook and Aspen. Am I alone in being glad that the boys are back? Ha! I spent all summer wondering when they were going to strike out on their own – again – and now I like seeing them with the family. A side note to this photo: The boys were working their way up to the band (I was out of the Jeep by this point), but curious Kreacher was either determined to get another last bite or was so focused on me that he didn’t notice when all the other boys disappeared over the top of the hill. He finally did when I walked back toward the Jeep, then trotted away after his pals. Wait for me! I drove on a short way, through another arroyo, then got out again and walked out to Poco, Bones and Roach’s “island” and took pix of them. Boy was I glad to see them! Not worried about them, particularly, but I miss them when too many weeks go by without seeing any of the horses. 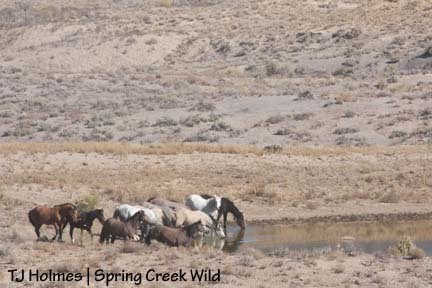 When I got back to the Jeep, I looked over toward the water hole that sits back to the east off the unmarked doubletrack, wondering if Bounce and his girls were still back in the east “pocket,” where they were last Sunday. When I was beside Lizard Mesa, I stopped and looked again – bingo! Bounce, Alegre and Gaia had just walked up on the edge of the pond! They started walking farther east on the doubletrack, so I sat in the Jeep and watched them through the binoculars. I hadn’t been close to them since the tour, but it was getting late, and I didn’t want to pursue them. But while I was watching them, guess who was walking out of the trees and making their way toward the water hole? While I was googling over Poco, Bones and Roach, Alpha marched her company around toward the pond. See the progression? Nap time, chow time, pub time! I have to say, the pond “pub” has a wonderful ambiance. Steeldust’s band has become pretty used to me over the months, do I decided to park and walk down to the pond (which is in the wilderness study area, I think?) and wait for the horses to come drink. If the horses walking toward the water had been Bounce’s band, say, I might not have risked being at the water when they came to drink. Bounce is pretty tolerant, and young Alegre takes cues from him pretty well, but I wouldn’t want to risk them not drinking because I was there. Steeldust’s band, on the other hand, would drink even if I was there, I figured, and I was right. I sat on the end of the pond opposite the way the horses approached and was glad the light was from behind me. I sat in full view, and they knew I was there. They waded right in, and drank and drank. I was glad of the opportunity to see them wade into the water because it gave me an idea how deep the pond is – almost up to their elbows! This pond dried up over the summer and refilled a couple of months ago after at least two intense cloudbursts in that eastern area. From left: Piedra, Baylee, Hollywood, Aspen and Chrome. 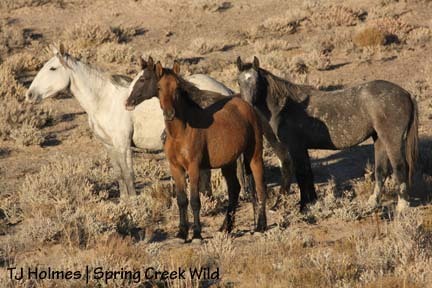 Another couple of bachelors were to the right (including Duke), but the two young stallions, Luna, Alpha, Mahogany, Ember, Kestrel and Steeldust were around to the left and closer to me. Steeldust drinking alone while his band spread along the banks of the pond to the right. In the “progression” I wrote about earlier, I forgot one very important element: play time! 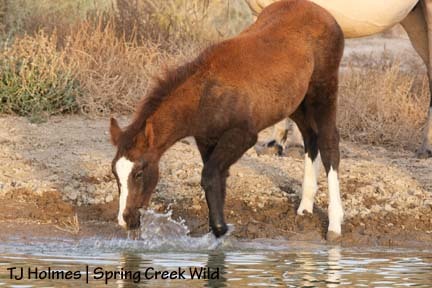 Storm doesn’t seem to be drinking water much yet, but the older foals are drinking water as well as their mothers’ milk. Don’t these boys make ya smile? 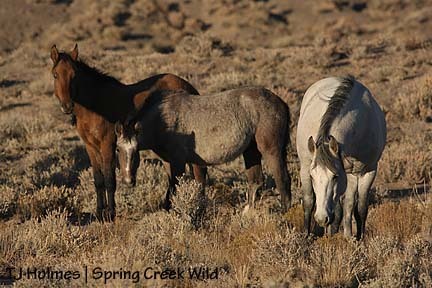 From left: Aspen, Mouse and Comanche. By then it was about 6:15 p.m., and the sun was below the far-west ridge, a reminder of the quickly changing seasons. It was a gorgeous day – a light-jacket morning but a short-sleeve afternoon. Just after the sun had gilded the clouds in the western sky, I was driving past Filly Peak and Grey’s band. Most of the band was on the mesa side of the road, but Houdini was below the road, so I waited for her to cross the road – because Iya was there! – then headed out and home. 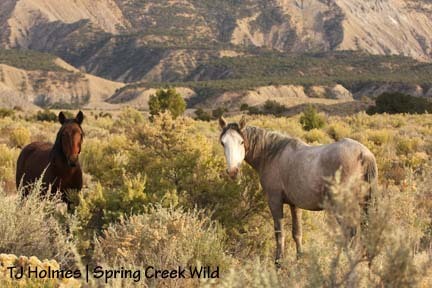 “If you’re lucky enough” to spend the day in Spring Creek Basin … you’re (I’m) lucky enough. Eh? For sure. Brr! Who turned down the thermostat? We have been enjoying a beautiful Indian summer, and the aspen this autumn have been fabulous. But an arctic wind blew in this weekend, and I think it brought a little bit of winter. We didn’t get as much rain as we were hoping for yesterday, but today was gorgeous – if chilly. In the basin, we hit a high temperature of just 48 degrees today. The ponies are playing hide ‘n’ seek lately, in the search for grazing, I think. I looked pretty hard for Poco, Bones and Roach, but I didn’t see them. Neither did I see Seven’s band or David and Shadow. Did see everybody else! But it took some looking. My first outing was lucky. I parked at my favorite hike-in spot along the county road and just walked in hoping to see something. Voila! The pintos were on the “bench” of their favorite hill. Mr. Mesa is limping a bit on his left front leg, but he was keeping up with the band just fine. Corazon was right in among the mares, but Copper still seems to be kinda sorta in charge …? One big happy family! There may or may not be a clear leader among the boys, but Kiowa – of course! – is first lady. I went up the hill, found a tree and waited for them to graze their way up on top. 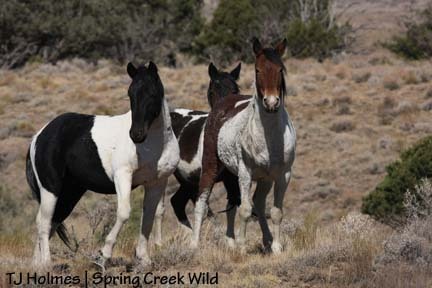 There’s Corazon at left with Chipeta and Kiowa in back. This was right after they realized I was sitting by the tree. Brave Chipeta checks me out while Spook and Kiowa graze in the background. Yearling Reya seems so big now. She looks just like mama Kiowa. Baby Spook is growing fast! This is the closest I’ve seen Mesa, left, to the other horses; the other boys usually keep him at a distance. 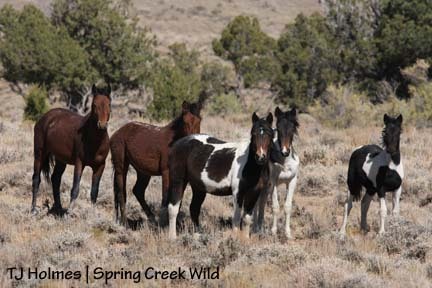 Copper is closest to the girls, then Kiowa and Reya and Spook. This is how I left the ponies; Ty finally decided to be in the picture. 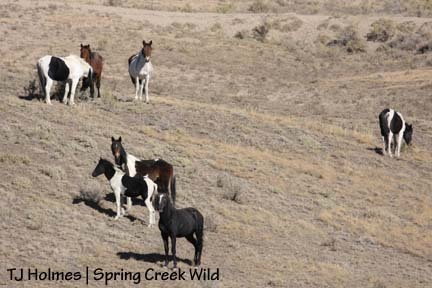 From left: Ty, Chipeta in front of Corazon, Reya in front of Mesa, and Spook, Copper and Kiowa at right. Later, from the summit of Round Top, I saw these guys right in the same exact spot. I felt pretty good about that, that I left them undisturbed. I have only a couple more pictures because I didn’t see any other horses from other than a distance. 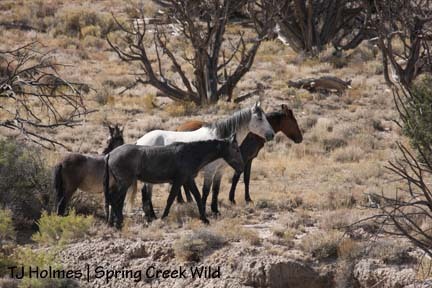 Grey/Traveler and his band were south of Filly Peak on the east side of the hill east of the corrals. The recent rain was obvious in some standing water here and there, but the road was easily drivable like last week. It was VERY windy, and that wind had an edge to it. It was a gorgeous day but chilly. 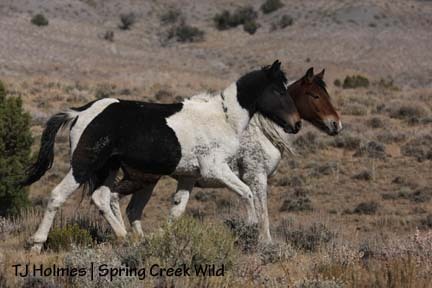 On the way to Round Top, I saw Duke reunited with Aspen and Comanche, and by their body language, I thought Steeldust’s band was near, but they must have been tucked up against the hill where I couldn’t see them. I decided to hike up on Round Top with the hope of spotting Poco, Bones and Roach, who have been MIA for several weeks now. But they remain so. I did find Bruiser and Cinch, slightly northeast of Round Top. When I drove around the loop, I got out a couple of times and did short hikes to see over hills … nada. Dunno where those ponies are. I’d really like to find Bones to see if she has good weight going into the winter or if she has gotten real thin again like last fall. 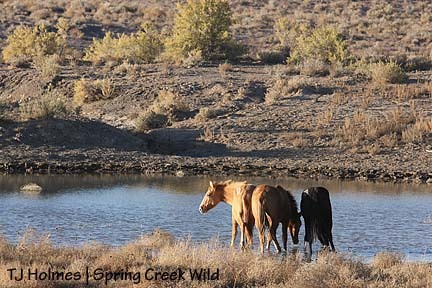 Bounce, Alegre and Gaia were back in the east pocket beyond the water hole (oh, the pond south of Round Top is still dry, just like the pond by Flat Top). They’ve traveled a bit since we saw them up in the north Tuesday. Chrome, Kreacher and Hook were on a hill above the north road. I saw them from about halfway between the two intersections heading toward the dugout, but I decided to go back toward where I had seen Duke, Aspen and Comanche earlier to see if Steeldust’s band was actually down there. Sure enough, a couple of minutes later, they all started walking around the base of the finger hills. Hollywood is still defending Piedra and Baylee. Mouse tried to sniff noses with Baylee, but Hollywood stepped in and put an end to that! On the way out, Grey/Traveler and his band were in the “valley” south of the water catchment. A beautiful, nearly full moon was rising above the eastern hills as I left. 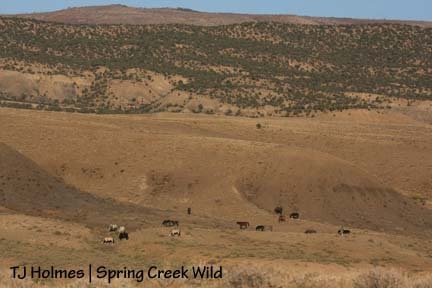 The place was packed with people coming to hear about the Spring Creek Basin herd – their herd! 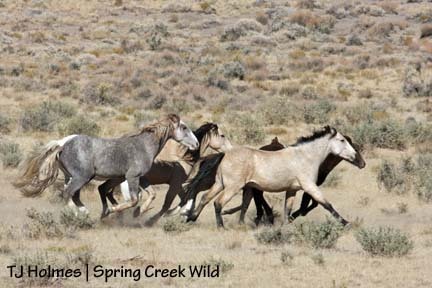 As Karen notes, sometimes people have no idea there are wild horses so close to home. 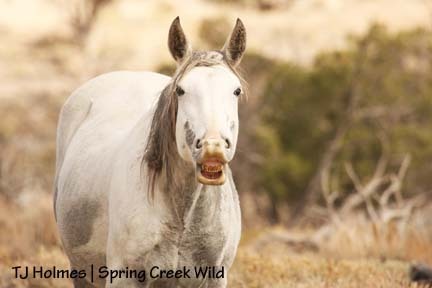 Pati talked about the National Mustang Association, particularly about our Colorado chapter, and what they’ve done for mustangs in the West and, particularly, our Spring Creek Basin horses. I’m amazed every time I hear Pati talk about all the group has done! The water catchment I’ve talked about recently on the blog, where at least Traveler’s band is drinking, is one of their projects. This group has been a valuable friend to the horses for more than a decade now. After Pati got people excited about the horses (all the NMA membership forms and other informational/BLM brochures she and David took were gone afterward! ), I got to step up and talk people’s ears off about my favorite subject! If I got long-winded, I’m sorry, and if I “talked to the horses” on the screen more than the people in the audience, I apologize for that, too. I get so excited telling people about each horse (I get to tell funny stories on them; I hope the ponies forgive me! 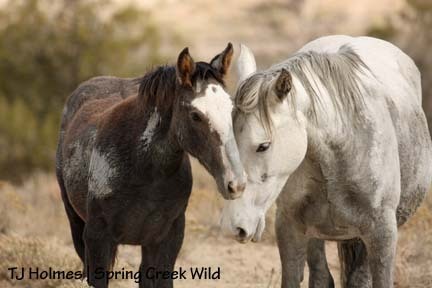 ), and I want them to love the horses as much as I do! After the program, it was so cool to have so many people come up and share stories about THEIR mustangs (! 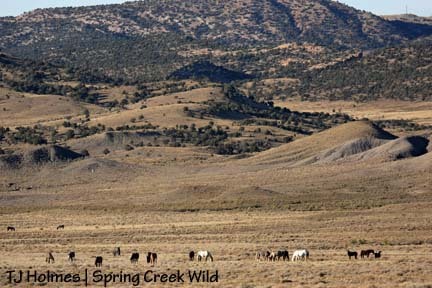 ), ask where Spring Creek Basin is located, how to get there and if they can just drive right in and see horses! I think the horses made 60+ new friends (and admirers) that night. The Living with Wildlife lecture series has had speakers on such other topics as mountain lions, bears and beavers, and I think the next one is about bighorn sheep. 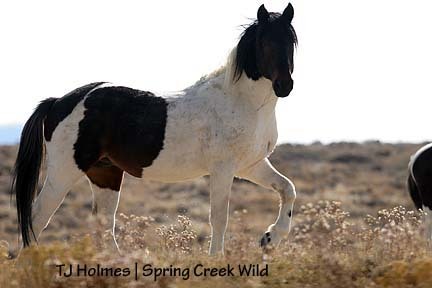 We were very thrilled to be asked to talk about our wild horses! For more information about the San Juan Corridors Coalition, visit the Web site at http://www.sanjuancorridors.org/. Tuesday, I had the pleasure to meet up with Kathe Hayes, with the San Juan Mountains Association, Bob Ball, BLM manager of the Spring Creek Basin Herd Management Area, and Mimi and Ken and Wendy, high bidders for the tours offered during the silent auction at the main Pony Up event in Durango back in August (I think there also was another, second high bidder for another tour). Bar none, Kathe provided the best lunch I’ve had in the basin. Our lunch bags were almost bottomless! We also got great lessons in plant identification from Bob. I camped in the basin overnight so I could scout some bands for the group. Grey/Traveler’s band was northeast of Filly Peak when I arrived in the evening. Big girl Iya, left, is nearly as big as her big sister Two Boots and big adopted brother Twister, both yearlings. Iya is 5+ months old. I was racing the setting sun, so I left them grazing on a hillside below the road and drove on into the interior of the basin to see who else I could find before dark. Steeldust’s band was back by Wildcat Spring. 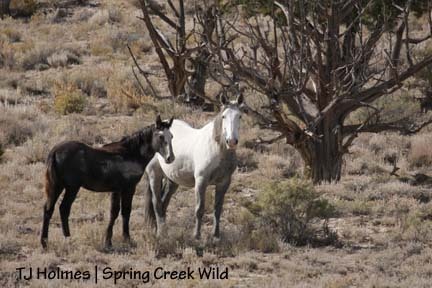 Bachelors Mouse, Comanche and Aspen are still with the band, and the “breakaway boys,” Duke, Hook, Kreacher and Chrome, are still hanging out in the north (we saw them Tuesday). Shadows had filled the basin clear to the eastern hills, so I found a rock and sat with the band for a little while until it got almost too dark to see them. It’s so fun to watch the babies of that band – Ember, Pinon and Storm! They’re curious about everything! The next morning, Steeldust’s band was fairly close to Traveler’s band, just down the hill from the water catchment, napping and taking advantage of the warm sun (frost on the windshield that morning!). Maybe both bands are using the water tanks?! The vegetation is kinda “slim pickin’s” back in the east, so I went north looking for Duke’s group. I hiked the trail around the hill from the water hole but didn’t spot them. But from that area, I spied Seven and the girls, Molly and Roja, far yonder south, north of Round Top. 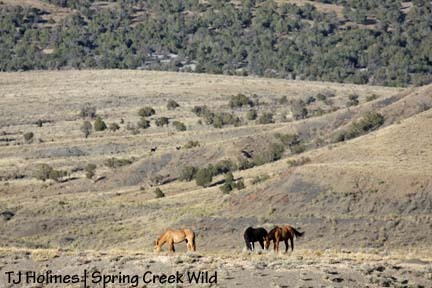 By the time I drove out on the loop, they were headed south between Flat Top and Round Top, Steeldust’s group was on the road toward Flat Top (possibly the water hole there? ), and Traveler’s band had run down the hill toward Steeldust’s into the broad “valley” south of the catchment. 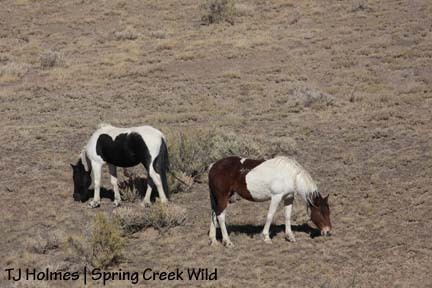 I spotted Chrome and Co. on the north hills before I got to Kathe and the tour folks at the interpretive sign, but the boys had slipped out of sight again by the time we got rolling. Unfortunately, Traveler’s band was way out toward Flat Top, and Steeldust’s band headed over the loop road toward the east-west hill by the time we got to the catchment. 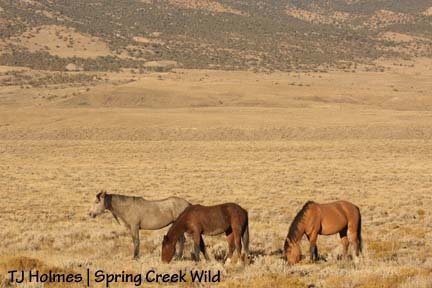 Steeldust’s band stopped to graze in the big open area west of Knife Edge by the time we got in position on the road. Hollywood and his girls – Piedra and Baylee – do seem to be with but slightly apart from the band. They show no inclination to wander off on their own, but Steeldust seems to have decided they’re with Hollywood; he actually snaked them away from his band Monday night while I watched. Right around the intersection to Round Top, we spotted Seven in the trees in the area between Round and Flat tops. Ken may have seen the mares, but I don’t think the rest of us did. We had lunch on the roller-coaster ridge overlooking the only pond that didn’t go dry this summer and found what seemed to be a gravesite for “Molly” marked “05-07.” She has a pretty incredible view. Thanks again to Kathe for the most excellent lunch. We made it all the way around the loop in Kathe’s Land Cruiser. I had hoped to spot Poco, Bones and Roach because I haven’t seen them for several weeks now, but it wasn’t to be. In fact, we didn’t spot horses again until Ken cried horse on the road to the north entrance – it was Bounce! I hadn’t seen him, Alegre or Gaia for a few weeks, either, so I was happy to see them … except that we saw just Bounce and baby Gaia. 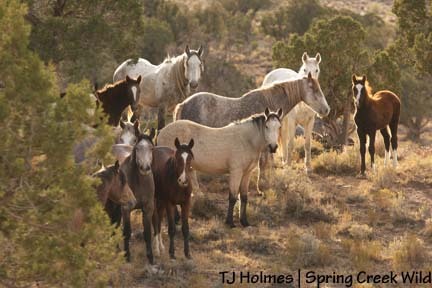 We were in the pinon-juniper, but we all got out and looked – nada. We drove on and spotted the boys, right near the north pond. They ran farther north, so we didn’t get a good look at them, but I’m glad they’re all still together. On the way back toward the intersection, we stopped, and Bob and I hiked up the hill toward Bounce and Gaia to see if we could find Alegre. I was pretty nervous by that point, memories of not finding Starla with Molly, Seven and Roja a month or so ago still fresh. We headed up toward Bounce, then lost him in the trees and veered off to come up to the side of him and the filly. Then Bob, who was back to my left, spotted a tail swishing in the trees. I thought I’d misjudged or the horses had moved and we had come up the hill right below Bounce, which wasn’t what I wanted to do … but then Alegre streaked across a gap in the trees! Good grief. I could strangle her for scaring me so badly, thinking something might have happened to her … 🙂 She and Gaia reunited, then they trotted off with Bounce. When we first saw Gaia and Bounce, everyone commented on how big Gaia is. 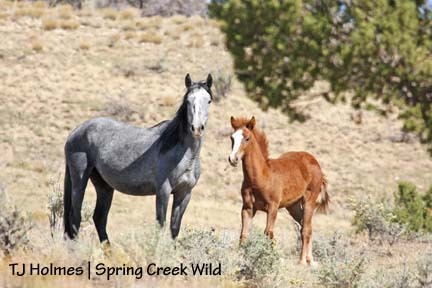 She’s about 3 days younger than Ember, the oldest of this year’s foals, and about five days older than Iya, who is enormous. I told Bob I was really worried when we didn’t see Alegre because “she’s one of my favorites.” Bob correctly summarized that they all seem to be my favorites, but, really, Alegre and Gaia are among my *favorite* favorites! And that was about our day. We drove back to Dolores via the county and Dolores-Norwood roads. I looked for the southern horses on the way past but didn’t spot anybody. It was a gorgeous day – just about perfect as far as weather. The basin got some rain from the weekend’s rain/snow storms, but none of the roads were enough to deter Kathe or her Cruiser. It was nice to meet you, Ken, Mimi and Wendy! 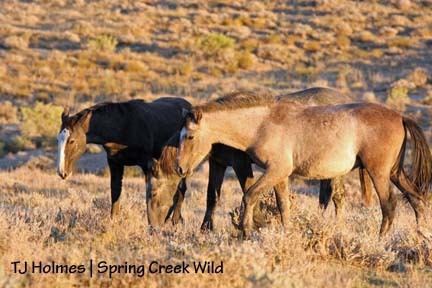 I hope you had a wonderful day seeing our wild horses of Spring Creek Basin!